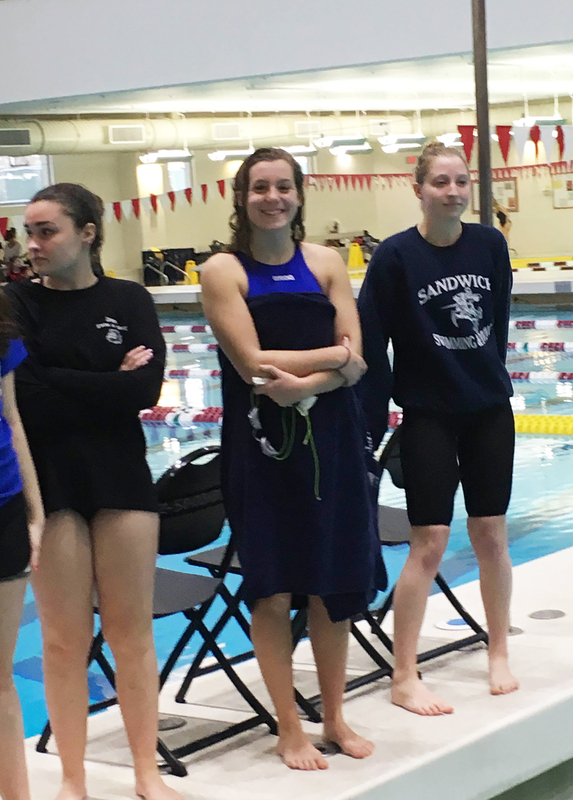 Rockland High School senior swim team captain, Sarah Margolis recently competed in the South Sectional MIAA championship bracket in two events. To be eligible to make sectionals, a swimmer has to get under a certain time for their event. In the sectionals the top swimmers of the South Shore compete against each other. After sectionals is another faster, cut-off time for the MIAA D3 State Championship. This is not Margolis’ first time making sectionals. As a freshman she earned a spot due to her time in the 200 individual medley (IM). This year, as a senior, Margolis qualified in the 200 IM and in the 100 breaststroke. Margolis has been swimming competitively since she was four. In addition to the RHS swim team, Margolis swims for the USA Sailfish Swim Team. Julie Margolis has been coaching her daughter for fourteen years. When Sarah was four, Julie was teaching swimming lessons and lifeguarding at the YMCA. Julie would take Sarah with her, and her boss allowed Sarah to stay in the aquatics office where she would play games and color with the staff on break. Seven years ago, Julie began helping what was then the Hanover/Rockland team. The team then split because the Hanover team had grown so big that they didn’t need Rockland swimmers to fill the gaps any longer. 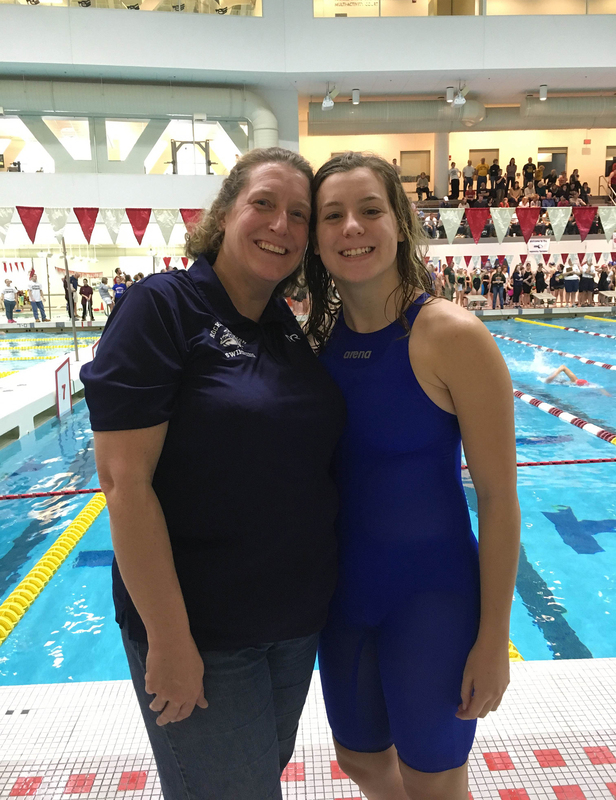 Julie says that having her daughters on the team has impacted her coaching because she wanted to have an RHS swim team for them. Recently, Sarah visited the University of New England in Maine with her friends to meet with the UNE coach. Julie thinks it’s “neat” to see that colleges want Sarah for her excellent academic potential as well as her swimming talent. The MIAA Central/South Sectionals for Girls were held at MIT on Saturday, Feb. 13 with an 8:45 a.m. start. Sarah competed in the 200 yard dash IM and the breaststroke. Congratulations to Sarah for a great showing in the sectionals and good luck as she continues her swimming in the future! 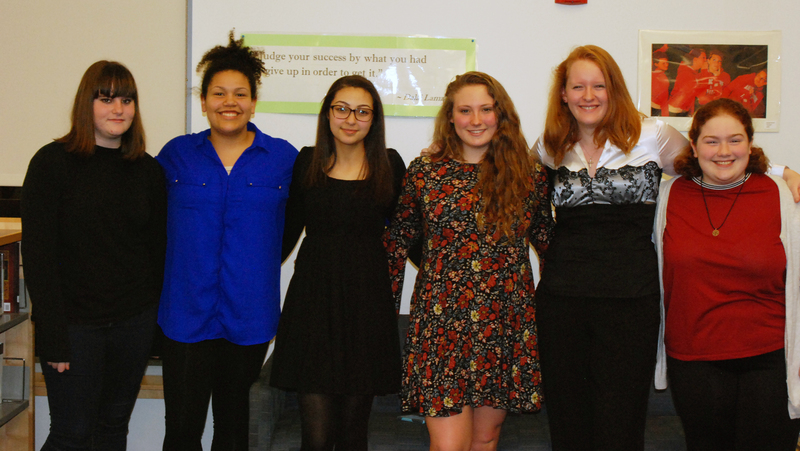 Under the direction of English Department Chairperson, Carol Cahill, six Rockland High School students participated in the annual Poetry Out Loud contest on Feb. 4. Poetry Out Loud contestants this year are Elizabeth Kelly, Adiza Alasa, Yousra Bendarkawi, Hannah Millen, Eden Dalton and Kellie Berry. Each of the students performed two poems which they chose from the Poetry Out Loud website. Eden Dalton was judged as the winner this year with Adiza Alasa coming in second and Yousra Bendarkawi coming in third. Eden Dalton was the Poetry Out Loud winner this year. Judging the contestants were Karen Bonn, Bill Boyer, Elizabeth Morrell and Laura Whitaker. The judges evaluated each student’s performance on physical presence, voice and articulation, dramatic appropriateness, evidence of understanding and overall performance. Accuracy scorer was RHS English teacher, Amanda McDonough. Rockland High has done well in Poetry Out Loud through the years. Good luck to Eden in the regionals! It is time for another edition of the RHS alumni series. For the fourth edition of the alumni series we went out and interviewed past graduates of RHS who have used their education as a catapult to future success. One is a woman who is now a professional golfer. Another is a man who is hoping to design video games. 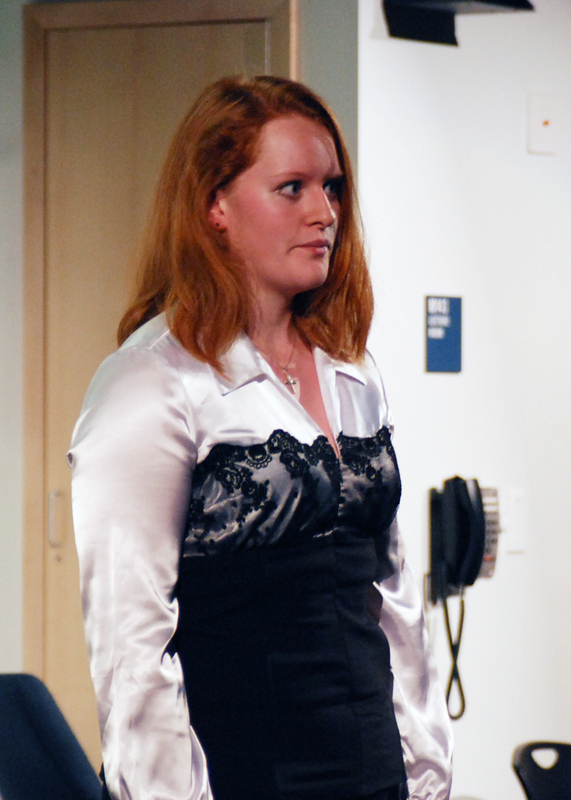 Last is a woman who is looking to broaden her horizons as an involved college student. 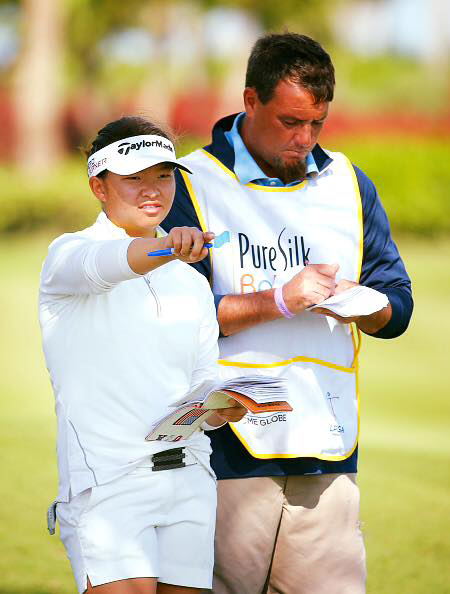 First is Megan Khang, Class of 2015, who is now pursuing a career on the LPGA tour as a pro golfer. Khang explained the importance of her Bulldog roots to her. “Being a Bulldog means to have each other’s back no matter what, since we are like one big family.” She says she greatly misses attending Rockland High School as well as seeing her friends everyday at school. She explained how her RHS education has helped her tap into her potential to get her to where she is now. Much congratulations to her as she just was involved in the LPGA Tour and headed down to the Bahamas to play her first tournament as a rookie. After having a great showing in the tournament she is excited for the rest of her rookie season. One of her long term aspirations is to become the best at the sport of golf among women. Khang emphatically stated, “I want to become the best woman golfer in the world.” That is her big endeavor and we wish her the best on achieving it. Her advice to the Class of 2016 is to, even when times get tough, believe in yourselves so you can seek out your full potential. Megan Khang is already making the town of Rockland extremely proud every time she competes because no matter where she goes she represents Bulldog Nation. Up next is Joseph Pumphrey, also from the Class of 2015. Pumphrey is going for his bachelor degree in computer science at UMass Dartmouth. Pumphrey says he was really fond of the teachers that he had at RHS saying, “RHS has some of the greatest teachers because they care about the students and they genuinely want the best for you.” He says he misses going to Rockland High School because it was fun to put forth your best effort into your schoolwork daily. To summarize Pumphrey’s advice to the class of 2016 is to take classes that are similar to the courses you want to major in at college and ace the classes that you absolutely love because that is what matters. 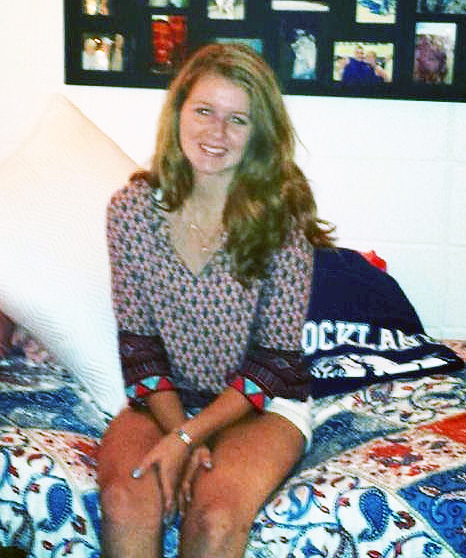 Our last alumni profile for this edition is Molly Garrity from the Class of 2014. Garrity is attending Loyola University Maryland. Garrity admits that she used to believe that being a Bulldog just had to do with school spirit and sports teams, but after being away from RHS for two years she thinks quite differently on this topic. Her advice to the Class of 2016 is to be honest with your peers if they’ve made an everlasting impact on you, because it’s those types of memories that you can appreciate and look back on in happiness for a lifetime. Molly Garrity is confidently embracing whatever future opportunities come her way, thanks to her education here at RHS. In closing, this concludes another edition of the alumni series. A special thanks to Megan Khang, Joseph Pumphrey and Molly Garrity for providing us with up-to-date information of how their time at Rockland High helped them get to where they are now. If you have graduated from Rockland High and want to be interviewed for the next or 5th edition of the alumni series please contact me at mivanoskos2016@rocklandschools.org. Thanks for tuning in; have a great week! The winners of the annual Boston Globe Scholastic Art Show, the Massachusetts Regional Scholastic Art and Writing Awards Competition, were announced on Jan. 29. 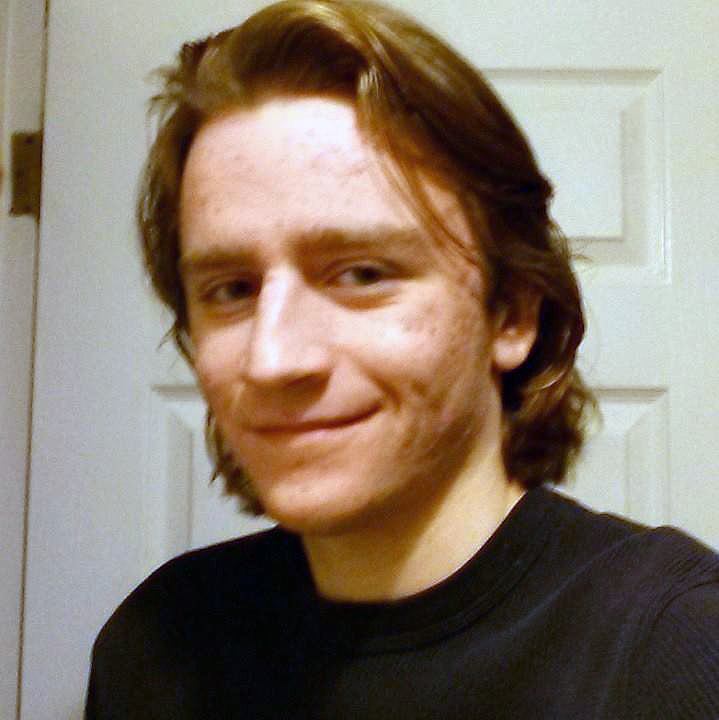 This year, two Rockland High School students were recognized for their artwork. Senior Celia Rosa won a Gold Key for her piece “Flowers Still Life” and a Silver Key for her piece “Self Portrait.” Both works were entered in the Drawing and Illustration category. Rosa’s Gold Key artwork will move on electronically to New York where it will compete against Gold Key work from around the country for National Medals. Junior Shawn Ward was awarded two Honorable Mentions for his pieces “What’s in The Box,” in the Ceramics and Glass category, and “Imagineer” in the Drawing and Illustration category. Senior Art Teacher Cheryl Thompson is their sponsoring teacher. According to the Award Committee, there were over 15,000 entries in Art. Over 50 judges looked at the entries and made their choices for Gold and Silver Keys as well as Honorable Mentions based on three criteria: originality, technical skill, and personal vision. A Gold Key Exhibition will be available for viewing from March 5–20, 2016 at the Museum. 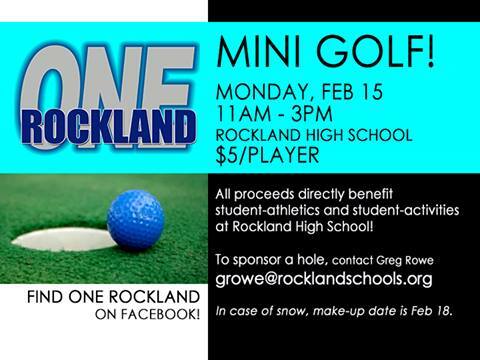 One Rockland Mini-Golf on Feb. 15: Don’t Miss Out! After raising more than $3,500 in the previous One Rockland Cable Auction, the students and staff involved in the upcoming One Rockland miniature – golf fundraiser hope to top that number. On Feb. 15 Rockland High School Bulldog mentors, and their advisor, Gregory Rowe, will be welcoming families to the classrooms and hallways of RHS to play indoor mini golf. The event will be taking place from 11 a.m. – 3 p.m. and will cost five dollars. While the Rockland community is enjoying their many rounds of mini golf, they will be benefitting current and future Rockland High School students. One Rockland has given RHS students the opportunity to volunteer their time during the fundraiser. In return they will raise money for the sports or activities they take part in. Different athletes and club members will be creating a mini golf hole, to represent their team or activity. Both RHS students and those planning to attend this fundraiser are looking forward to the fun it will bring to their Monday morning and afternoon. With constant positive energy and hype from the Rockland Bulldogs, it is hoped this event will bring an enthusiastic atmosphere all throughout Rockland High School and in the Rockland community. Make sure you come and join the Bulldogs as well as the Rockland community on this day full of golf and smiles.